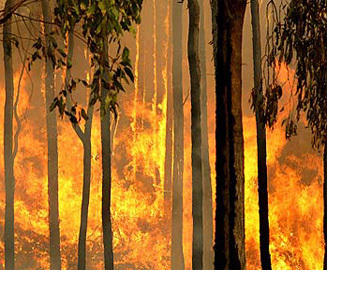 Unfortunately, bushfires are a fact of life for homeowners in suburban and rural areas around Adelaide, and a hot summer can be a time of high risk for all. Our roller shutters add an additional line of defence for those who live in bushfire-prone areas. During a fire, extreme heat can cause the glass in windows to crack or explode, leading glass to fall from its frames, and this then allows spark and burning embers to get inside your home with all of the attendant risks that this brings. We manufacture and install bushfire-resistant roller shutters for windows and doors that are able to withstand extreme radiant heat, and in so doing prevent your glass form shattering. Our shutters are insulated with polyurethane foam and come with a strong exterior baked enamel finish, increasing their resistance to flames, so adding further bushfire protection. At Direct Shutters, we work extensively with leading roller shutter producers OZRoll, and we are very proud to be able to offer custom-made roller shutters produced using the OZRoll AE401 range. These shutters have been independently tested by CSIRO (in November 2010) and have been shown to be able to withstand the impact of an extreme bushfire. During the testing process, OZRoll AE401 roller shutters were subjected to radiant heat exposure of 40kw/m2 and an hour’s exposure to these temperatures did not produce any ignition or flaming, while the shutters also retained their integrity and continued to be operable. This led CSIRO to classify these shutters as being capable of withstanding a severe bushfire attack at BAL40 (Bushfire Attack Level 40). We are able to provide our customers with solar power remote control roller shutters that offer an ideal solution in areas that are at risk of bushfires. Operated via small solar panels attached either to the pelmet or to a wall, solar power roller shutters can continue to be opened and closed even when mains power is cut, as so often happens during a fire event. This means that your shutters can still be controlled, and can still protect your home, in the most challenging bushfire scenario. We also offer battery-powered OZRoll Drive System (ODS) remote control roller shutters that likewise are operated independently of mains electricity.